Whether your applications and data reside in the data center, private or public clouds, at the edge of your network, or a combination of the above, you need the flexibility to operate seamlessly across all environments. You can achieve this with infrastructure solutions that are agile, automated, scalable, and easy to manage—like hyperconverged infrastructure. 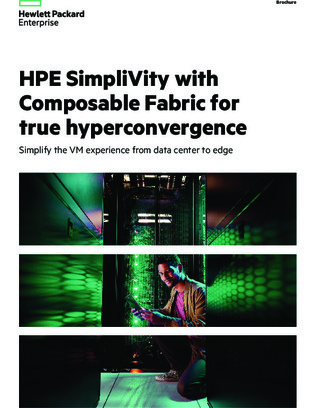 This brochure provides an in-depth look at HPE SimpliVity with Composable Fabric, a solution that converges compute, storage, networking, and advanced data services for virtualized workloads. To learn how to get started and grow with ease, read on.